Custom hang tag printing does more than add to your product’s overall packaging. Going beyond pricing, hang tags can show customers how to properly take care of the product or highlight what exactly it has to offer. Custom tags can also enumerate any award the product or your business has won. 2” x 3.5” is the standard for a rectangular hang tag, normally seen on most business cards. 2” x 4” has a slightly longer dimension than the standard and is ideal for a horizontally oriented tag design. 2” x 2.5” is a good choice for a tag that with a shape slightly closer to a square, which is normally seen on clothing labels. 3.5” x 6.5” is our largest size available and is suitable for designs with lengthier text and larger images. Each cardstock option helps complete your product packaging’s distinct story. 10 pt. Cardstock is thin enough for folding but can easily withstand double-sided printing. 14 pt. Cardstock is a thick, durable choice normally used for standard business cards. Highly recommended for a card that’s not too thick or thin. 16 pt. Cardstock is our thickest option and ideal for hang tags with a premium touch and feel for the entire design. Detailed information on the gloss, matte, and high gloss UV coatings can be found in this Help Center post. 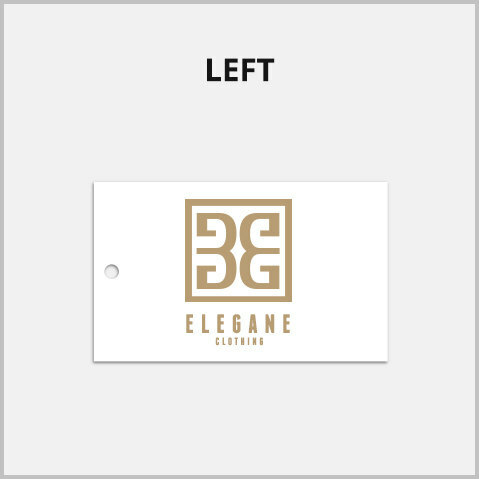 Rounded corners give your rectangular hang tags smooth edges that distinguish them from the standard shape. Hole Drilling comes in several sizes, including the standard 1/8” and the largest 5/16”. We also offer two medium hole sizes: 1/4” & 3/16”. Top-Center is the standard placement for most price tags. Top-Left or Top-Right is a subtle location that shifts the focus on a long vertical or large horizontal tag design. 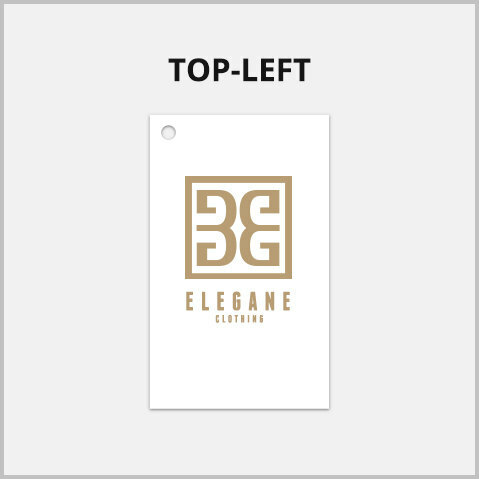 Left or Right is another flexible, standard location normally seen on rectangular hang tags. Note that strings are not included with any hang tag order. If the rectangle doesn’t fit your needs, we also offer other shapes such as square, round, oval, and leaf. Hang tag printing orders can be ready after 1 business day. Just upload your design or download our layout templates to get started. When would I need to add hole drilling to my custom hang tag? Hole drilling is recommended for those who will manually place a string to the personalized tag. It is a smart option for packages that are sent out during the holidays or for any product that highlights a special promo or new feature. Can I get my hang tags the next business day? Yes, we can print your hang tags fast and have them ready for shipping on the next business day. Select your preferred printing turnaround on our online calculator. Rectangular Hang Tags is rated 4.8 out of 5 by 15. Rated 2 out of 5 by Jaxx from Weren’t what I expected They did not come out the way I expected and the holes weren’t punched in the corner as instructed.